1. Cut out the center of the paper plate, so only the rim is left. 2. Dip a small sponge in black paint and dab on the rim. Cover about half to make the beard. Allow to dry. 3. On the opposite side, tape the popsicle stick for the handle. 4. Tape on the hat cutout on top. 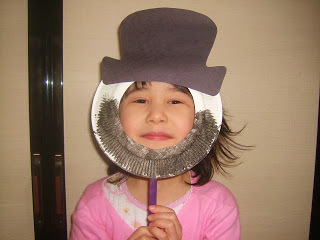 This entry was posted in Crafts and tagged children, family, Fun, holiday crafts, learning, Presidents Day. Bookmark the permalink.